Paul Manafort, who attended the June meeting as a senior campaign adviser (he was named chairman a few days later), was also questioned by the Senate Intelligence Committee behind closed doors. Reuters reported that special counsel Robert Mueller’s investigators are targeting the longtime political consultant on possible money-laundering charges in connection with payments he received from Russia-backed Ukrainians, in hopes of “turning” Manafort to testify against others in the Trump campaign. Kushner’s defense is that he’s “clueless,” said The Sacramento Bee. Despite Kislyak’s repeated attempts to arrange meetings, Kushner indicated no awareness off why “Russian interests might have wanted to cultivate him.” He blamed oversights for his failure to disclose 100 meetings with foreign nationals on his security clearance form. This is the guy Trump has asked to broker peace in the Middle East and reorganizing the entire federal government. If he’s even half as “naïve” and “incompetent” as he makes out, he’s in way over his head. 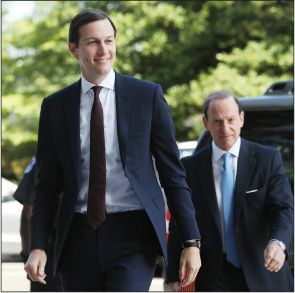 Kushner’s explanations “raise more questions than they answer,” said Sarah Posner in WashingtonPost.com. He didn’t explain how he missed the subject line on Trump Jr.’s email chain—“Russia - Clinton - private and confidential”—or why he didn’t bother “assessing whether the meeting was worth attending.” Nor did he provide a good answer as to why he would agree to communicate with Russia on a secret back channel. As for his insistence he never “relied” on “Russian funds” for his real estate business—what does “rely” mean? Kushner is definitely hiding something, said Wendy Dent in The Guardian.com. Two of the Russians at the June meeting worked for the oligarch owner of Prevezon, a Russian company that was under investigation by U.S. authorities for “allegedly attempting to use Manhattan real estate deals” to launder stolen Russian money. One of Prevezon’s main business partners is Russian-born billionaire Lev Leviev, from whom Kushner bought $295 million worth of Manhattan office space in 2015. After Trump entered office, his Justice Department abruptly settled the Prevezon money-laundering case for just $6 million—a relative pittance. Was that settlement a quid pro quo for Russian help during the election?